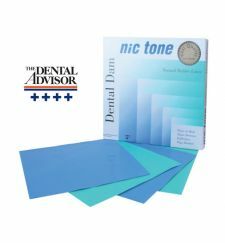 Home Dental Dam & Accessories Nic Tone Dental Dam - 52pcs. 5" x 5"
- Made with the finest latex Low in proteins and powders. I've been advised to use them by one of my master (David Gerdolle, works in Switzerland) and I can see why. I am using them every single day, for absolutely all my bonding procedures. It is also good to alternate with the thin one (when I have to go through several tight contact points) and the thick one (when I need to push the gum a bit if the margins ares lightly sub gingival). The only rubber dam I will use. The perfect compromise between strength and elasticity for ease of use without tearing. I have tried many others (including much more expensive brands) and nictone is by far my favourite. This is great dam. It has a quality feel compared to any other dam I have ever used. It is easy to place and has never torn on me. The light blue is gentle on the eyes and is also a great backdrop for intra-oral photographs. I use rubber dam routinely so having a quality product like this that is easy to use and saves me time is a great help. Did You Like This? Share it.